This oneâ€“ofâ€“aâ€“kind threeâ€“DVD set is the most comprehensive instructional overview of gaited horses ever produced. Brenda Imusâ€”the leading gaited horse clinician in the USâ€”thoroughly explains the insâ€“andâ€“outs of riding, training, and caring for the gaited horse. Whether your passion is Paso Finos, Tennessee Walking Horses, Missouri Fox Trotters, or another gaited breed, the basic tenants of Imusâ€™ philosophy apply: proper hoofcare, appropriate bitting, good saddle-fit, and educated riding will help you optimize your horseâ€™s natural gaits; prevent back, hock, and stifle problems; and enjoy the happy partnership both you and your horse deserve. 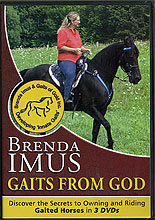 BRENDA IMUS is the worldâ€™s most widely recognized authority on the subject of gaited riding horses, actively traveling throughout the US and Canada teaching and presenting at clinics and expositions. She is the author of two books and the gaited horse column for Trail Rider magazine, and has served as a consultant for EQUUS magazine. In addition to her teaching and writing, she designed the Imus 4â€“Beat saddle built specifically to accommodate the needs of gaited horses and improve their overall performance. She and her husband breed and train a variety of gaited horses on their farm in southwestern New York State.